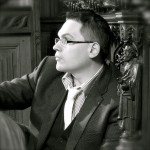 Stacy Horn » Blog Archive » Paul Mealor, Where Have You Been All Our Lives? Paul Mealor, Where Have You Been All Our Lives? There was one piece at the wedding today (Kate and William, who else??) that stood out for me, I loved it instantly. I looked at the list of what was played and it had to be the motet by Paul Mealor, but I can’t find a recording to confirm. But it’s got to be his. I’m familiar with most of the pieces, or the composers at least, and this one was very very different. And amazing. It had that Eric Whitacre haunting, other-world quality that I just love (which is not to imply that it’s derivative or un-original). Anyway, a new composer to love! Yay!! Here’s a piece about how it came to be sung at Kate and William’s wedding. Good for him.